Indian army is inviting online application for the fresher 12th pass candidates to apply for the 10+2 Technical Entry Scheme 2019. 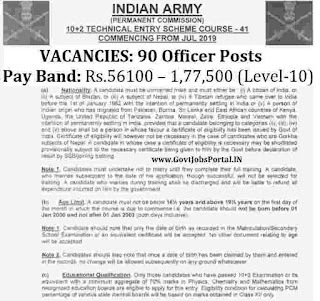 A fresher notification is out from the Indian Army Recruitment department in which they said that they are starting the process for 10+2 Technical entry scheme 2019. There are total 90 vacancies which are going to be filled up through this Indian Army recruitment process 2019. Candidates will be placed as an officers after completing their training under this technical Entry scheme. More information related to these army jobs in India for officers is given below in this article. Read out the complete article carefully before moving to online application or this 10+2 technical entry scheme 2019. We shared all the official links for applying as well as for the official advertisement under IMPORTANT LINK section at the last of this article. Profile Name: 10+2 Technical Entry Scheme Officers. Educational Criteria: Applicants who have passed in their 12th class examination with 70% marks are eligible to apply for this Indian Army recruitment process 2019. But the applicants must have SCIENCE STREAM in their 12th class examination that means must have Physics, Chemistry and Mathematic Subjects in the 12th class. Age Bond: Applicants Minimum age must be 16 years and 6 Months older and the Upper age limit is 19 years and 6 Month older. Those who lies in this age criteria can apply for this 10+2 technical entry scheme 2019. ZERO application fee is required for applying this Indian army recruitment process 2019. All Category candidates can apply without any application fee. ONLINE Process for applying this Indian Army recruitment process 2019. You have to follow the official website of Indian Army for online application The link will be active on 29th Oct. 2018 for applying online. This link will be remain activated up to 27th Nov. 2018. So all the applicants have to apply online between these dates. You can not apply through the off-line mode for this 10+2 technical entry scheme. Online application are accepted for this Indian Army recruitment procedure. We also share the link under IMPORTANT LINK section for online application. 29TH Oct. 2018 is the opening Date to apply. 27th Nov. 2018 is the Last date to apply.